Two weeks ago I visited my boyfriend Matt. He's at a work training in Raleigh, NC for a few weeks so we had a fun weekend exploring the area. On one afternoon we decided to drive to Duke University. Matt is huge college basketball fan and we've heard that the campus was beautiful. It was incredible! They were setting up the campus for the next class of students and it made us very nostalgic for our alma mater the University of Dayton. We walked all over campus and even stopped in their Duke Basketball Hall of Fame. Towards the end of our time there it had started to rain so we headed back to the car and decided to venture out to find some place unique for a snack. We had had a late protein-filled breakfast so we were just looking for something to tide us over to dinner. 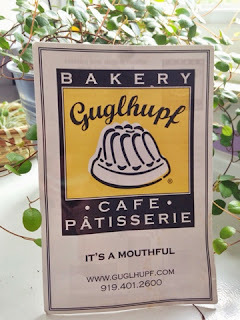 We ended up satisfying our sweet tooth too at the highly recommended Guglhupf Bakery in Durham, NC. The place is a lot bigger than I expected because it has two sections: one full bakery and another larger section for their cafe. There is also a nice outdoor area with seating and some unique art. The rain seemed to be slowing down so we decided to poke around the patisserie to see if they had anything that struck us. When you walk in, you get a delicious aroma of their heavenly smelling breads. The sweets all looked too pretty to eat. The woman working recommended the two tarts pictured. I chose the fruit tart and Matt chose the chocolate custard tart (surprise, surprise) and we split them. 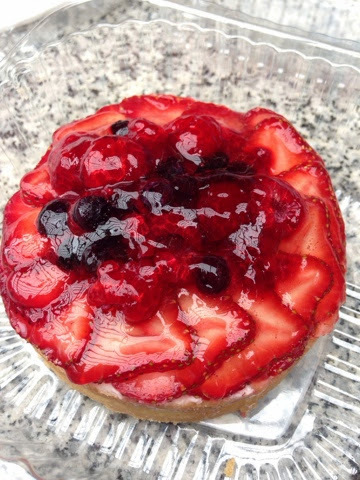 The fruit tart was sweet with a flaky, buttery crust. 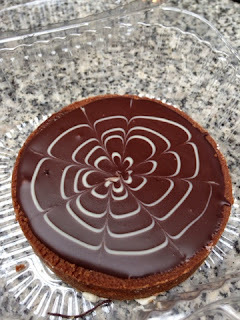 The chocolate tasted very similar to my chocolate ganache tart and had a delicious chocolate crust. I'm glad we split that one because I love chocolate, but that would have been chocolate overload for one person. 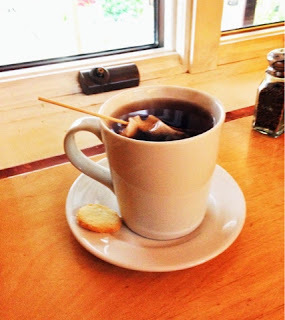 It was still cool with a light rain after we finished our tarts so we headed into the warm and inviting cafe. It was maybe 2-3pm on Saturday afternoon and pretty crowded! According to Yelp, it sounds like you need a reservation pretty much any night of the week. I ordered a yummy chai tea (that came with a little butter shortbread) and Matt had a cafe au lait. Their cafe menu is full of warm soups, fresh salads, and sandwiches. Their dinner menu has some delicious looking German dishes too. I'm jealous I don't have a sweet little neighborhood bakery and cafe like this! If you're in the Durham area, its not to be missed.